The Curatorial Knowledge Forum held on 17 November 2012 in Karachi, Pakistan, was part of a two-week residency programme - the Asia-Europe Curatorial Knowledge Workshop. The programme was supported by the Asia-Europe Foundation (ASEF) in the framework of the Creative Encounters programme. The discussions explored the importance of building new support frameworks for Pakistani art in order to make it more relevant in the societies it is emerging from. The artist and curator Atteqa Malik was there to report for culture360.org. 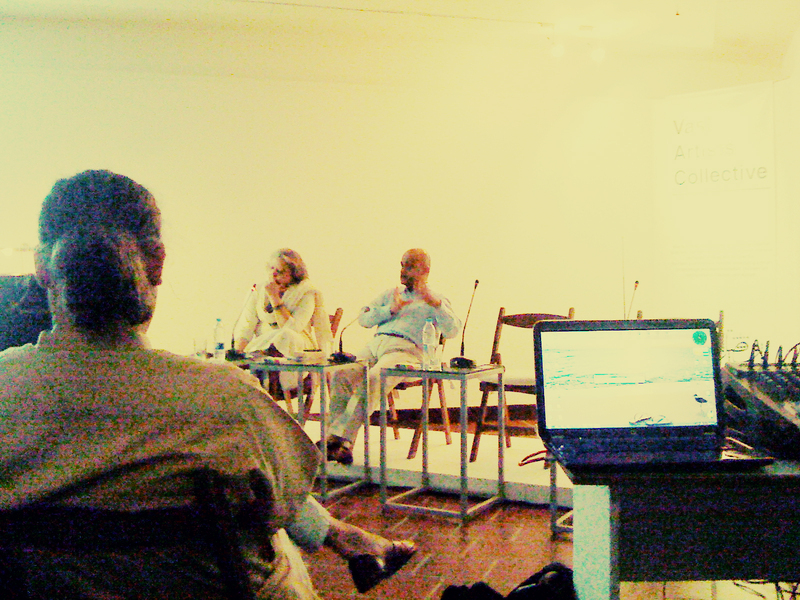 The Curatorial Knowledge Forum held on November 17th 2012 at the Indus Valley School of Art and Architecture gallery was a healthy initiative organized by Gemma Sharpe and Adeela Suleman from Vasl Art Collective. Not much public discussion takes place in Pakistan on curators and their obligations to local communities. Due to the shortage of professionals in this country, a curators job has often been taken up by art critics, writers, gallery owners and many times the artists themselves. The forum last month brought forward a timely agenda since Pakistani art has become a marketable commodity in local and international buyer circles since the past few years. The aim of relooking at the definition of curators was stated to be the central focus of the Forum on Curatorial Knowledge when Gemma Sharpe of Vasl introduced its panelists to the participants. The panelists were from diverse backgrounds, each bringing his or her own personal stories, which resulted in an informative exchange between them and the fifty art practitioners who attended the event. Niilofur Farrukh the first speaker, an experienced art critic and political activist in addition to being a curator, sparked the audience straight away into thinking about art and its obligation to community enrichment. She discussed models of curating by dissecting the concepts behind 2 of her curatorial projects. By dwelling mainly on the agenda of creating community dialogue through shows she showed how such efforts become a source of knowledge for others and are able to question stereotypes. Just as local writers in every community help us understand our reality, political and human rights activists are also able to communicate directly with individuals through their work practice. Niilofur emphasized that it is important to listen to local voices and thus not fall onto what Rashid Arai calls the “dependancy syndrome” of post-colonial societies. The first curated exhibition discussed by Niilofur was 'No honour in killing'. It had been a dedication to the five female victims in Nasirabad, Pakistan, who had been buried alive under the guise of honour killing. Niilofur pointed out that the project had not meant to exclusively focus on gender issues. Different strategies had been adopted to initiate dialogue on violence against women in the communities that the travelling show touched and to include artists’ reactions to the event that inspired the show. In addition to being shown in the urban areas of the country, 'No Honour in Killing' was displayed in many rural spaces, some, where community dialogue through activists had already been initiated. Thus the art was received by audiences familiar with the event or similar events like it. As the show travelled through big cities in Pakistan to certain rural areas it shed light on how Pakistan's rural population could access art in an affirmative manner. The audience had already experienced honour killing but a new experience emerged for them through viewing the art and ensuing discussions. Niilofur stated that the artwork did trigger a feeling of helplessness within the audience but also resulted in the Asian Human Rights Commission bringing the issue forward in the media.At University of Sindh, Jamshoro, 600 students between the ages of 18 and 26 attended the discussion on honour killing that had been woven into the exhibition schedule. At other venues local artists were asked to participate with their responses. The show began with 15 artists and after 2 years it included 36 artists. Niilofur concluded that the disconnection between our urban and rural communities should not be ignored. Curatorial strategy behind the second show that Niilofur chose to describe was the Asna Clay Triennial. It had initially been curated as part of the World Social Forum and was felt by Niilofur to reflect for individuals their own empowerment and that of others. The main action of this show was to penetrate the community but it also highlighted the common ground between crafts and contemporary art practices. Part of the show would be a Potters Fair (Kumhar Mela). Fifteen hundred children would interact with the exhibits during the show's 3 week programme. The Asna Clay Triennial has been held every three years since 2000 except for 2009. Niilofur marked that the show’s success refutes the myth that lots of money is needed to hold events featuring international artists. Quddus Mirza, a Pakistani writer in Urdu and English, was a well-placed speaker after Niilofur's presentation because his expectations from art curators differed from hers. From his paper “Curating Culture” on curatorial PR’s, he described curators to be the community's mirrors to artists and artwork and thought that the importance being given to curators is a recent phenomenon in our society. He was disdainful of curators who had multiple persona and felt that they were trying to assert their roles in a society where art survives on relations of power. Many shows like those on 'Truck Art' appeared to Quddus Mirza more as cultural endeavours on part of the curators than art shows. He was openly critical of curators, who at the expense of Pakistan’s global image, were cashing in on the themes of Terror, Clash of Civilization and Women at international art gatherings. He described how in the city of Karachi where “gunpowder is the main scent in the air” the definition of culture had expanded to include politics as well but wondered if this was the only glimpse that international audiences were interested in seeing of our part of the world. His words were bitter against those curators who had encouraged this negative stereotyping of Pakistan to happen. In a meaningful discussion that followed Quddus Mirzas talk, Niilofur responded to Quddus' statement on multi persona of curators by saying that it was difficult for such curators to separate their skills. She felt that they needed to use all the tools they had available in order to address the fact that art was under-utilized in our society. Quddus questioned why most curators were working with the same themes. “Why can't there be a show on the colour purple?” he asked. He gave the example of Ijazul Hasan who is a political person but his art does not deal with that directly. Niilofur felt that curators need to be true to themselves and negotiate suggestions to keep exhibitions open in a society that still needs to acquire critical thinking. A member of the audience asked Quddus what his personal view on the “No Honour in Killing” show was. Quddus replied that he couldn't comment as he had not seen the show. Both Niilofur and Quddus agreed that there seemed to be a frequent selection of Pakistani art that had news value for exhibitions outside Pakistan and resigned it to the fact that “violence sells”. The session after the lunch break started off with a reading by Emaan Mahmud, a writer, editor and artist, from her paper “Champa Begum speaks”. Emaans paper written most wittily, described the intense feelings experienced by an urban, noveau riche housewife during her search for artwork for her living room wall. Champa Begum would face utter confusion when confronted by contemporary art pieces that didn’t fit her preconceived notions of good art and then would try to resolve the dilemma in her soul in the most humorous manner. Ironically it is due to the unyielding desire of the many Champa Begums in our society to patronize good art that there is great demand for, and a lot of money spent to own, pretty, hangable art that is being produced in Pakistan of late. The seminar then moved into a panel discussion titled “Curating Perfomance” chaired by Ayesha Omar. Participants were Abdullah Qamar from Dhaba Art Movement, and performance artists Farwa Ibrahim and Rabia Naseer. Abdullah introduced the Dhaba Art Movement saying it had been inspired to promote its own manifesto through street performances after noting how a politician had employed entertaining transvestites to promote his election manifesto. He had observed public activity at local tea stalls, especially during times when there were electricity outages in the city, and was inspired to found the Dhaba (small tea stall) Art Movement which now had a following of about 1000. Abdullah said that his agenda was to promote change in people through art as it had changed him, and the purpose of softening souls. Abdullah was asked how he took responsibility for the people who worked with him especially in volatile neighbourhoods. His response was that there was preparatory work involved before any performance which included sitting at the local tea stall and chatting with the people from that neighbourhood to build trust. He described an incident where his group had naively set up a performance in an area without any previous knowledge of the community and had been 'beaten up' within a couple of hours by the residents as they had felt that their space had been disrespected. However after that incident and the preparations they made thereafter resulted in the fact that they had been received well at every other place they performed. He stated that documentation was most of the time not an option in order to maintain the comfort level they had created between themselves and the publics they interacted with. Farwa talked about her performance art being connected to cleansing and ritualizing. One of her pieces required the insertion of her and Rabia's photo in all the family portraits that were present in an American family's home. She felt that this work was a reaction to her and Rabia's initial feelings of alienation when they were exposed to another culture in a country far away from home. Farwa spoke about there being an overlap between herself as artist and curator. She felt that she curated her own performance by deciding where it would be held, what media was used to document it, what would be the spatial parameters etc. She also described a work where she and Rabia invited a complete stranger, preselected for them, to their home. They would play the perfect hosts to their guest and serve him or her, a typically Pakistani meal which they would have prepared themselves. Rabia emphasized that performance art relies heavily on curatorial knowledge so even though they were not curators themselves they felt that they could contribute to the forum quite actively. They were unsure whether the roles they played in order to make their performances click were those of collaborators or curators. The forum ended with the screening of a short eight minute film Lacuna, 2012, by Jamie George, an artist from the UK. The film had been initiated during an artist/curatorial residency at Vasl in March 2012. The film featured mostly a stationary camera in a stairwell filming the changes in the light quality of the stairwell at different times of the day. The resulting image had been digitally worked on using colour and sound effects. A very interesting piece which explored in a number of ways the situational relationship of the camera with the subject filmed. At the end of the day I felt that the discussions on curatorial knowledge at the forum just about prodded the skin of that juicy fruit that needs to be bitten into more thoroughly by academics, writers and the public. Opening up and exposing the relationships that bind curators and artists to their communities could result in the building of new and necessary support framework that Pakistani art needs in order for it to have more meaning in the societies it is emerging from. On an email list I belong to called Bricolabs, a colleague John Hopkins recently put this quote by Chris Corrigan, which I feel quite aptly describes what curators need to do and many are doing without knowing. "Non-doing defines doing. Sitting in stillness invites people to move. Getting out of the way allows people to fill space with their passion. Letting go of expectations leaves room for responsibility to come forth. All of this is integrity. Every piece of doing requires the strong presence of non-doing to anchor it. Stifling every impulse to intervene, to give directions and orders leaves space for others to design their lives. You can create a container and then stand by and watch it fill and teem with life. You don’t resist the natural movements of groups of people co-creating their futures. Instead you work on your own inability to be still, to want to own the outcomes, to want to invest your ego. With an MA in Media Studies from the New School University, New York 2002, Atteqa Malik is a freelance digital artist, scholar and cultural operator from Pakistan who studies the changes that arise in the human condition as old values meet new technology. Atteqa was part of ISEA 2010 Art Review Committee in Oct 2009.In association with ISEA in July 2008, Atteqa was invited to participate in a summit at the Asia Europe Foundation, Singapore, on Media Arts_Policy and Practice. She also presented a paper “Media Blackout_Networking news inside Pakistan” at ISEA 2008 in Singapore and talked about her student digital artwork under the theme “Karachi, past present and future”.